(Nanowerk News) Small, smaller, “nano” data storage! Interest is growing in the use of metallofullerenes – carbon “cages” with embedded metallic compounds – as materials for miniature data storage devices. Researchers at Empa have discovered that metallofullerenes are capable of forming ordered supramolecular structures with different orientations. By specifically manipulating these orientations it might be possible to store and subsequently read out information. Metallofullerenes – when deposited on a surface – form ordered islands of identically orientated molecules. This scanning tunnelling microscopy image has been reproduced in colour in order to improve visual analysis – a different colour has been used for each individual orientation of the molecules. Carbon exists in the form of diamond, graphite and nanotubes– and also as so-called fullerenes. The spherical structures of such fullerene "cages" - the most frequently-observed representative of which contains 60 carbon atoms and looks exactly like a football – may also serve as “nanocontainers” for metallic compounds. These so-called metallofullerenes have special electronic properties, which are of particular interest to the IT industry for use as possible "nano" data storage materials. Together with colleagues at the University of Zurich, the Paul Scherrer Institute and the Leibniz Institute in Dresden, researchers in Empa’s “[email protected]" laboratory have been studying metallofullerenes and have been able to show that, when deposited on a surface, these form ordered islands with domains of identically orientated molecules. Different orientations have, however, been found for the endohedral metallic compounds. Provided an external stimulus could be found which would be able to bring about a change between different orientations – like a switch – the basic mechanism for data storage would have been achieved. Empa researchers published their results in the journal Physical Review B ("Looking inside an endohedral fullerene: Inter- and intramolecular ordering of [email protected] (Ih) on Cu(111)"). Fullerenes were discovered in the 1980’s as the third modification of carbon. Soon after, researchers began working on the idea of embedding clusters consisting of individual elements or compounds into the structures of these “nano-cages”. The synthesis of such molecules – so-called endohedral fullerenes – was achieved just a few years later. Metallofullerenes have primarily attracted interest in the IT and pharmaceutical sectors. Among other applications, metallofullerenes can be used to provide a contrast medium for use in magnetic resonance tomography. The molecules studied by Empa researchers are endohedral metallofullerenes, consisting of 80 carbon atoms forming the carbon cage with an embedded tri-metal nitride (1 nitrogen atom, 3 metal atoms) unit. The metal used is dysprosium (Atomic Number 66), an element of the lanthanides group. Endohedral complexes cannot be formed with all metallic elements in the periodic table – the lanthanides, however, can be successfully put inside the carbon cage. There are, in fact, very few alternative uses of the element dysprosium. One application is the use of the metal as an alloy with lead for the shielding of nuclear reactors. 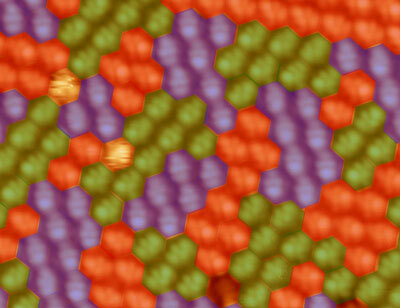 The research was carried out by producing a single molecule-thin layer of the metallofullerene on a copper substrate. The ordering of the metallofullerene on the substrate was then investigated by means of a scanning tunnelling microscope and through photoelectron diffraction performed at the “Swiss Light Source” (SLS) – the Paul Scherrer Institute's synchrotron facility. The experiments showed that the embedded metallic compound “feels” the substrate and takes compatible orientations.